- Either electronic files or hardcopies of manuscripts are acceptable for review. Please see Manuscript Submission. - Electronic files of accepted manuscripts must be provided for publication. - Manuscripts submitted to JEI must not have been partly or fully published, or simultaneously submitted for publication elsewhere. A full paper is a contribution describing original research, including theoretical exposition, extensive data and in-depth critical evaluation, and is peer reviewed. A full paper submitted to JEI should be in an appropriate length while no maximum number of pages is stated. Multiple part papers will not be considered unless they are all submitted together. When the length is over 15 pages, each extra page will be charged USD 150. Authors who wish to submit review articles are advised to consult an editor before preparing their manuscripts. Only critical review papers will be considered. The format and length of review papers are more flexible than for a full paper. Review papers are also peer reviewed. A technical note is an original contribution that describes a process or technique without necessarily including a theoretical exposition, extensive data or in-depth critical evaluation. The objective is to inform readers who may wish to use or adopt the process or technique. Technical Notes are no more than 2000 words, plus one page space for tables and illustrations, and are peer reviewed. A research note is an original contribution that describes experimental and/or theoretical research with a limited range of results, not necessarily with a complete data set, or critical evaluation in depth. The purpose is to inform readers of preliminary or limited results of research, which may be used for further development of the subject. Research Notes are no more than 2500 words, and are peer reviewed. Comments on papers already published on JEI are welcome, but subject to the criteria of interest, originality and the approval of an editor. Comments can include extensions to, or criticisms of, those papers. They must provide arguments that are reasoned, and not presented in a confrontational fashion. They will be sent to the author of the original paper for reply, the outcome of which may be publication in a future issue. Comments and Authors' Replies should not exceed 1500 words each. Manuscript must be typed on one side of the paper in double spacing throughout including references with Letter page setup and ample margins all around. All pages of your manuscript including title page (page 1), references, tables and illustrations must be numbered. Line numbering should be applied to each text page. Excessive layout styling should be avoided such as automatic word breaking and multiple columns. List all authors and their affiliations on a separate page. The corresponding author must be identified. The full mailing and email addresses, phone, and fax number of the corresponding author must be provided. A summary with no more than 250 words, covering the aims of the work, methods used, results obtained and conclusions reached. Abbreviations should be avoided. 5 - 8 suitable keywords in alphabetic order should be supplied for abstracting purposes. The SI Units and Symbols are preferred. Unusual characters or symbols should be explained in a list of nomenclature. As for the mathematical symbols and equations in the text, please type them directly in the word document, instead of using MythType or Word Equation Editor. Huang, G.H., Baetz, B.W., Patry, G.G. and Terluk, V. (1997). Capacity planning for an integrated waste management system under uncertainty: A North American case study. Waste Management and Research. 15(5), 523-546. doi:10.1177/0734242X9701500507. Names of journals can be abbreviated according to the "International List of Periodical Title Word Abbreviations". In case of doubt, write names in full. Futagami, T. (1970). Dynamic programming of sewage treatment systems. Advances in Water Pollution Research, Proc. of the Fifth International Water Pollution Research Conference, San Francisco, II-21, 1-12. Goicichea, A., Hansen, D.R. and Ducktein, L. (1982). Multiobjective Decision Analysis with Engineering and Business Applications. John Wiley & Sons. Yeh, S.C. (1996). Grey Programming and its Applications to Water Resources Management. Ph.D. Dissertation, School of Civil and Environmental Engineering, Cornell University, Ithaca, N.Y., USA. USGS. (1993a). Persistence of the DDT Pesticide in the Yakima River Basin, Washington, United States Geological Survey Circular 1090. 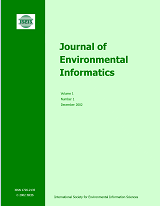 JEI is a publication registered with CrossRef for cross-linking by digital object identifiers (DOIs). Authors are encouraged to add the DOI to each citation if available. The query interface (www.crossref.org/guestquery) provided by CrossRef can be used for easy DOI lookup. All equations should be numbered and be edited by MathType equation editor. Equations edited by Word Equation Editor are not acceptable. Equations should be labeled in the order in which they appear in the text with Arabic numbers in parentheses aligned to the right margin. In writing the equations use the following rules: vectors and matrices with bold, functions such as log, sin, cos normal, and all other mathematical symbols with italic. Tables should be numbered consecutively throughout. Each table must have a caption (use Title case) above it with the same font as text. Vertical lines should not be used, and leave adequate space between data columns. Illustrations should be numbered consecutively throughout. For illustration with multiple similar sub-figures, sub-heading should be added to each figure. Both line drawings and photographs must be included in the same numbering sequence. Photographs should be clear, sharp, black and white prints with good contrast. JEI recommends that only EPS, TIFF or JPEG formats are used for electronic artwork. Microsoft Office files (Word, Excel and PowerPoint) are also accepted. Please note that PDF formats are NOT accepted. Each illustration must have a caption below it with same font as text. Color illustrations may be published in the print version of the journal at the author's expense. Authors should notify the journal at the time of submission if they wish color illustrations to accompany their article. The charges will be set based on current printing cost and sophistication of the work. Alternatively, illustrations may be published in the print copy in black/white format with a color version appearing in the online version free of charge. - A double-column setting is used in the publication. Tables and illustrations should normally be fit into single column (82mm or 3.1"). But large tables and illustrations can be published across the two columns (page width 170mm or 6.5"). Tables and illustrations larger than page size will not be accepted. Before submission, size the illustrations close to the desired dimensions of the published version. - Indicate in the text the position where a table or an illustration should appear (normally between two paragraphs). - Each table or illustration must be on a separate page and they should be placed at the end of the manuscript. Footnotes should be avoided except for the one for corresponding author on the first page. In case footnotes are necessary, mark footnotes in the text with an asterisk (*); use a double asterisk (**) for a second footnote on the same page. Authors are required to suggest at least three (up to six) individuals who could serve as reviewers and supply their contact information (names, institutions, email and mailing addresses, telephone and fax numbers). The suggested reviewers should be experts in relevant fields. The editors will try to use at least one reviewer from the list. See Selection of Reviewers in JEI's Operating Procedure. The list of your suggested reviewers should be on a separate page (hard copy), or in a separate file (electronic submission). Proofs of an article accepted for publication will be sent to the corresponding author for review and must be returned promptly as instructed. If the manuscript is not returned within allotted time, the editors will proof read the article and it will be printed per their instruction. The copyright of papers accepted for publication becomes the property of the International Society for Environmental Information Sciences. Authors are required to sign a copyright assignment form prior to publication. The corresponding author of a published article will receive a PDF copy of the offprint. Hard copy reprints of an individual article can be ordered from ISEIS, the Publications Division, by using the reprint order form. Excess fees are charged for all full papers, including those for which authors pay an open access fee. When the length is over 15 pages, each extra page will be charged USD 150. JEI offers authors an open access option whereby their articles will be freely available to both journal subscribers and nonsubscribers via JEI's website. This option is available for articles that have been accepted for publication and is subject to a fee of USD$3,000 (or CAD$4,300). Authors of previously published articles may also choose the open access option for their works via the same process. Please send an email to jei@iseis.org for further information. Either electronic files or hard copies are accepted by JEI. These include using email attachment, or the online submission provided. Electronic submission is preferred since it saves significant time in processing. Please go to Manuscript Submission for detail. JEI will send you an acknowledgement message via email once your submission has been received. This message will include an identification number assigned to your manuscript. Please make note of this number for your records. All future correspondence with JEI regarding your submission will require this identification number.